Have you been loving all of the Christmas inspiration from the My Creative Time team this week? I know I have been! Today we are all making cards for you, and I just had to pull out our latest stamp and die set, No Peeking! I absolutely love this stocking die! I die cut it using some cute plaid paper from the Carta Bella Christmas Delivery collection and heat embossed the sentiment with white embossing powder. The pretty pine boughs were made with dies from Fun Stitched Ornaments & More. Of course I had to dress up the background by using one of the Postage Frame Dies and one of the dies from Stitched Rectangular Frame Dies & More. This was a pretty quick card to make - it would be easy to mass produce! OMG Miss Katie....What a Super Sweet Card!! I just love how you used all of Miss Emma's Awesome goodies..I love the papers you chose and your Postage Stamp mat idea sure showcases that Cutie Patootie stocking and the Plaid is Perfect. You so did a Super Outstanding Creative job!! Pretty!! Love the plaid stocking! Wonderful Christmas card! I like how you used so many MCT products to make this card. Love the woodgrain backgrain and pine sprigs! Darling stocking! Pretty card! The Plaid stocking looks awesome! LOVE the Echo Park paper collection and fab stamp shaped die! I am so loving this card, the pg paper looks amazing with this stocking! 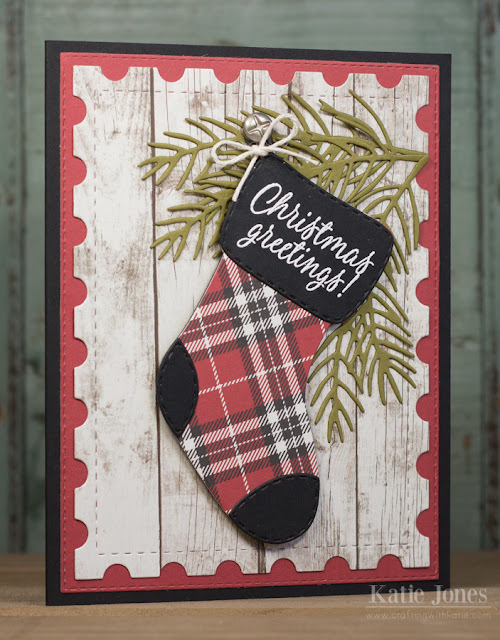 Love the rustic look with the plaid stocking and wood grain background. I love your card! The background is cool and I love anything plaid so the stocking is perfect to me. The wood grain background is *the* perfect canvas for your star performer: the sweet plaid stocking! So pretty! Ms. Katie, I just love your card. Everything looks so good together. Great job! Super, duper cute! LOVE your plaid stocking! Fun layers to! Your card is so cute. I really like the postage stamp die. What a warm and rustic Christmas card! Love the plaid and bough against the whitewashed wood! Reminds me of a cabin scene...so pretty. I sure have been enjoying the 5 days projects.